For federal prosecutors the bill's approval may signal 'the beginning of the end' of the Lava Jato investigations. SÃO PAULO, BRAZIL – In the early hours of Wednesday, November 30th, as Brazilians grieved the deaths of Chapecoense soccer players in a tragic plane crash, Brazil’s Chamber of Deputies approved the much-anticipated anti-corruption bill by 450 votes for, one against and three abstentions. Anti-corruption bill voted in Chamber of Deputies, photo by Fabio Rodrigues Pozzebom/Agência Brasil. The bill, however, did not resemble the original proposal, signed by over two million Brazilians, and criticism poured in during the entire day. “The ten [original] measures against corruption no longer exist,” said Brazil’s Attorney General of the Republic, Rodrigo Janot, in a statement. “What was best in the project was excluded and clearly retaliatory measures were included. It should be said that the amendment approved, in fact, aims to intimidate and weaken Prosecutors’ Office and the judiciary,” concluded Janot. Of the ten original measures proposed, Chamber deputies only accepted four. Among those issues that remained from the original bill was the criminalization of politicians receiving undeclared donations in previous elections. 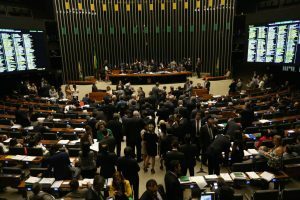 There had been rumors that the Brazilian Congress would once again try to save their own members by including in the bill that the anti-corruption laws should be applied only to future irregularities and not past transgressions. One of the most controversial items in the approved bill is the inclusion of a clause that would make the ‘abuse of authority by magistrates and members of the public prosecutor’s office’ a crime. The item was included, say prosecutors, as a clear retaliation by politicians to the Operação Lava Jato (Car Wash Operation) investigations. 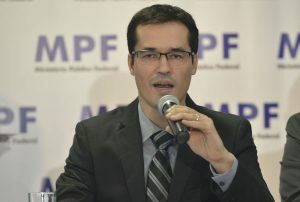 Lava Jato Prosecutor, Deltan Dallagnol says bill is retaliation for investigation, photo by Jose Cruz/Agencia Brasil. “This was the most radical maneuver I saw in the form of a system’s reaction against an investigation,” said Lava Jato task force coordinator, Prosecutor Deltan Dallagnol, during a conference in Rio de Janeiro. “I believe that this was the reaction of some of those being investigated, of certain people against the investigation,” he added. During the day the group of federal prosecutors working in the Lava Jato investigations stated they are considering taking radical measures. “The proposal is to collectively resign if this proposal is sanctioned by the President,” said prosecutor Carlos Lima at a press conference in Curitiba. For the group, the bill has the objective of intimidating investigators. “The Chamber signaled the beginning of the end of the Lava Jato,” the group said in a statement. Analysts say that many politicians are concerned about what other illegal activities the investigations might uncover. Executives from the Odebrecht Group are expected to sign plea bargaining agreements any day now and, according to local news outlets, the agreements could include the incrimination of as many as two hundred politicians from all political parties in the corruption graft. Chief Justice of Brazil’s Supreme Court, Carmen Lúcia Rocha, criticized the bill stressing that there are already statutes in Brazil’s judiciary system that compel judges to account for their actions and that democracy depends on strong and independent powers. “One can try to silence the judge, but it has never been possible, nor will it be possible, to silence justice,” said the Chief Justice. Rebuffing the criticism, Chamber President Rodrigo Maia said that Lower House has the independence to vote for what they believe. “The Chamber has all the legitimacy to ratify, to modify or to reject (bills). We are not required to approve everything that arrives in this plenary,” he said. The Brazil need to change! I hope be fast!